Here are my comments on the 10 photos. Since these are originals, without modification of contrast or brightness, the differences between them can be attributed to differences in focus and lighting. 3882. Not much can be told from this photo due to focus and lighting. The undertail coverts appear to be whitish. 3886. Out of focus. This is the photo that appears most like a BTG. However, note that even in this one the eye line appears blackish, and much too dark for a normal BTG. The crown appears olive, but I think this is due to it being out of focus. There appears to be a blackish subauricular. The breast appears to have a yellow wash, the undertail coverts appear whitish. 3887. Severely out of focus. 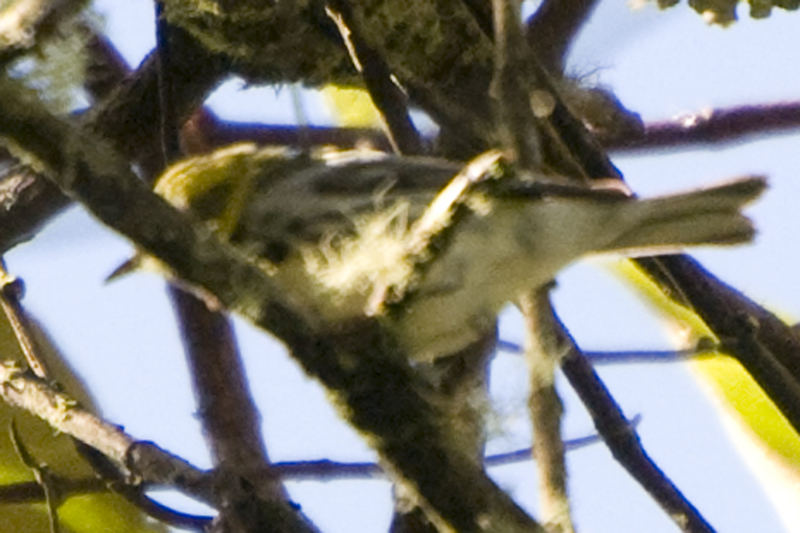 Front of breast appears to have a yellow wash, undertail coverts appear whitish. 3903. Too dark to evaluate. 3904. Dark. Bird appears to have a blackish subauricular mark. 3905. Dark. 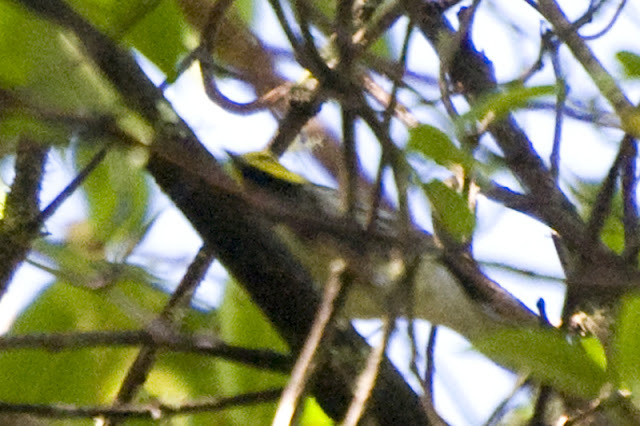 Bird appears to have black eyeline and a slight subauricular mark. 3907. The black eyeline is evident, but the subauricular mark appears to be almost absent. The undertail coverts appear whitish. 3909. A strong black eyeline is evident. However, the subauricular mark is nearly absent, and looks like a shadow. The crown appears olive, again I think because of lack of focus. 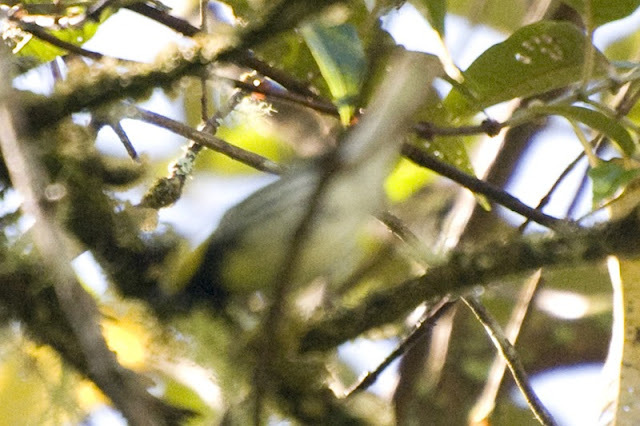 Note particularly that in this photo the upper part of the breast appears whitish, while the rest of the underparts, including the undertail coverts, appear yellowish. 3910. Blackish eyeline is present. Dark subauricular is very faint. 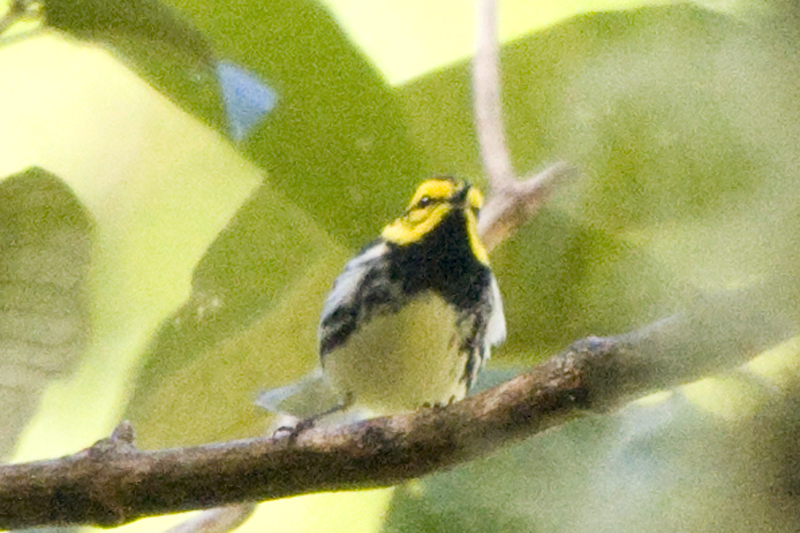 Crown appears blackish, with a thin vertical yellow line on forehead. Breast appears yellowish. 3911. Bold blackish eyeline. Crown is distinctly black. A strong black subauricular appears to be present. 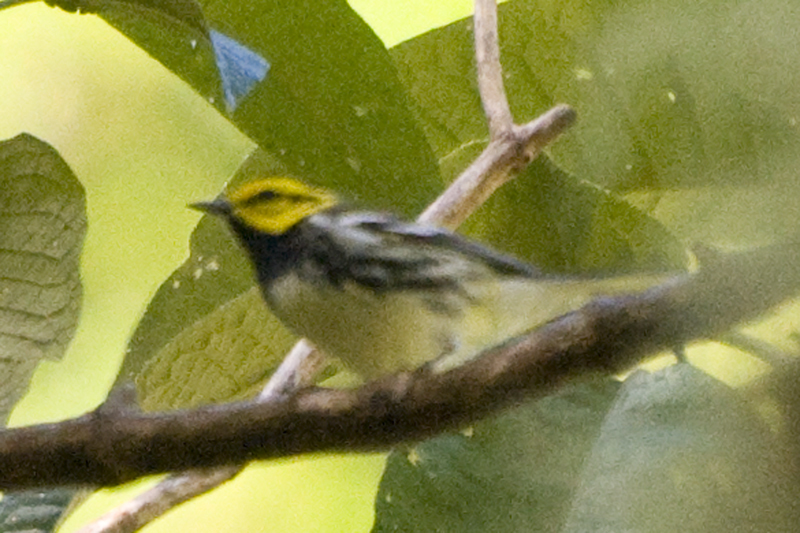 The underparts, including the undertail coverts, appear to be washed with yellow. Note that, in every photo in which it shows, regardless of lighting, the eyeline is bold and black. This includes 3886, the one that most resembles a BTG. I think that this definitively excludes it being a BTG. I don't see how lighting alone could produce this feature so consistently if the bird actually had an olive eye line. The feature is present even in the shots that are well lit and in good focus. The crown can't be seen in most photos. It appears black in 3910 and 3911, both of which are well lit from above and in reasonable focus. Again, I don't see how an olive crown could look this black under these lighting conditions. The crown appears to be somewhat olive in 3886 and 3909, but both of these are badly out of focus. Note that in 3886 the upper margin of the bill also appears olive, even though it certainly is black. The black subauricular is very prominent in 3911, but nearly absent in 3909, 3910, and 3907. This suggests to me that it could be due to a shadow or ruffled feathers. The yellow cast on the underside is present in every photo. However, its extent and intensity vary considerably between photos. 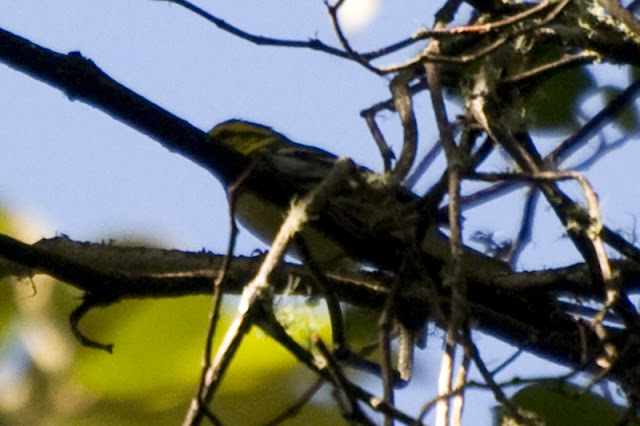 In some photos the undertail coverts appear whitish, while in others they have a yellow cast. While most photos appear to show a yellowish cast on the breast, in 3909 the upper part of the breast appears whiter than the lower underparts. 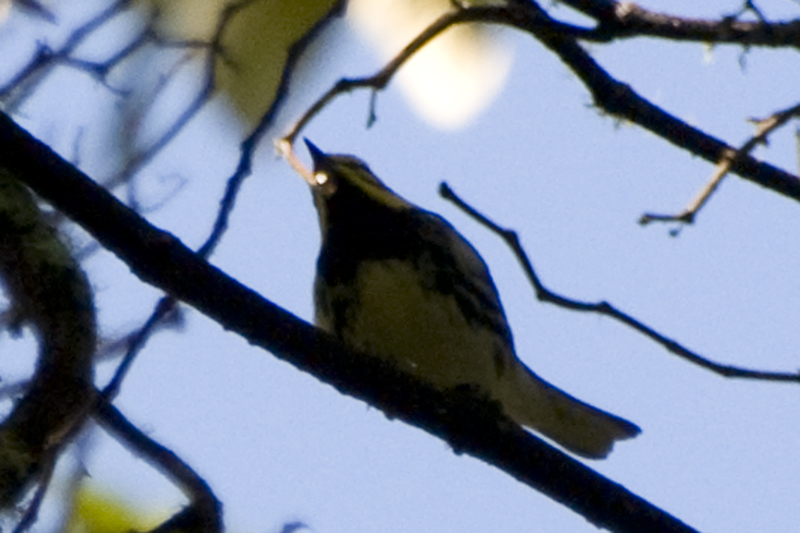 This variability suggests to me the yellow color could be due to reflection off leaves from below, rather than the actual color of the bird. Overall, I think pure BTG can be ruled out, as can pure Townsend's. The features that differ from GC are variable between photos and could be due to lighting. Lee Jones has suggested the possibility of a Townsend's x BTG hybrid, which are known to occur and have less black on the face and yellow on the breast than Townsend's. However, they still have more black on the face than this bird. It's possible that a backcross could produce a bird with even less black on the face. However, given the scarcity of Townsend's here and the distance from the area of hybridization I think such a hybrid would be even less likely to occur in Panama than a GC. 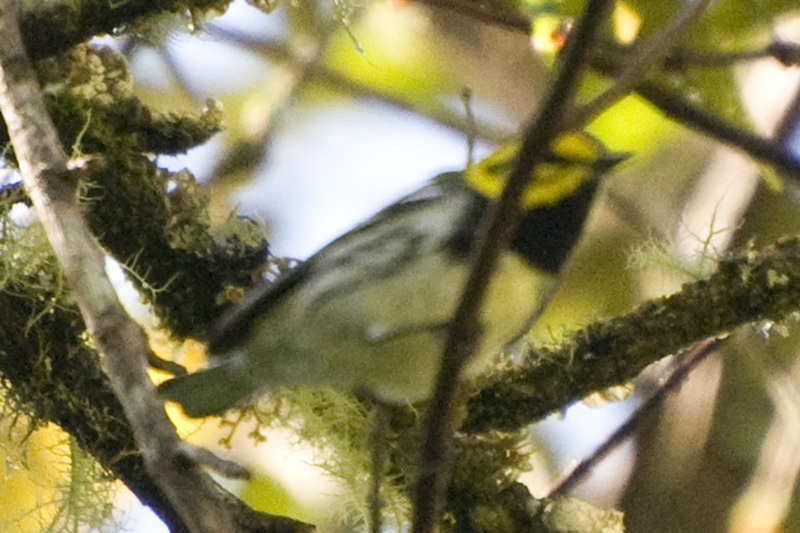 With reference to the 2008 warbler photograph, I would note, at the risk of iterating the obvious, that diagnosing birds in photos is a different game than identifying them in the field. I'm not especially good at the former because I haven't studied all the clues--the vagaries of light, exposure, blurring, etc.—that need to be taken into account. Improving at this game takes more practice than I have given it. 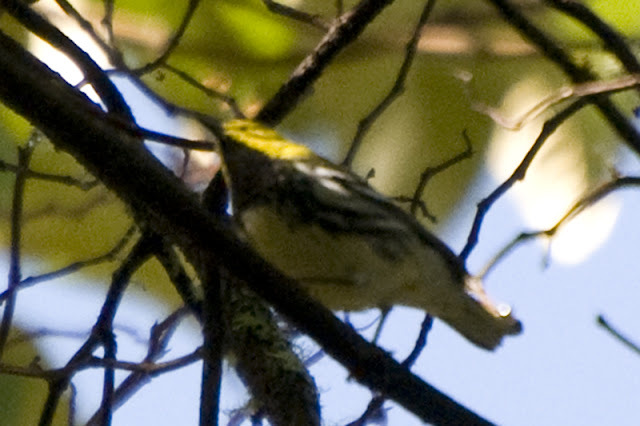 For that reason, when attempting to identify a bird from a photograph, especially one of compromised quality, I resort to my field practice of putting more emphasis on present-absent features than on features of degree (coloring, shading, focus, and the like), which are more unreliable due to distortion. 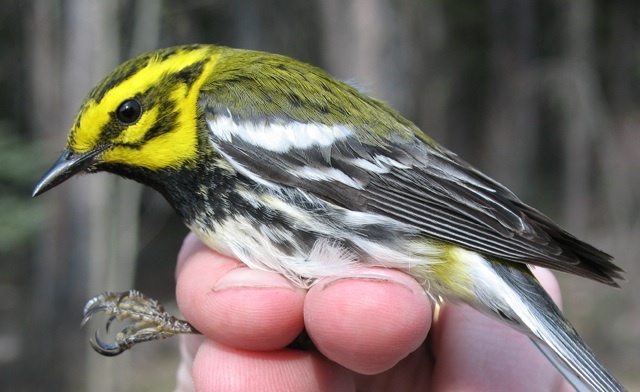 With this in mind, I would suggest basing identification of the warbler on the second photo that appeared on Xenornis (the one posted on the 17th of Feb). 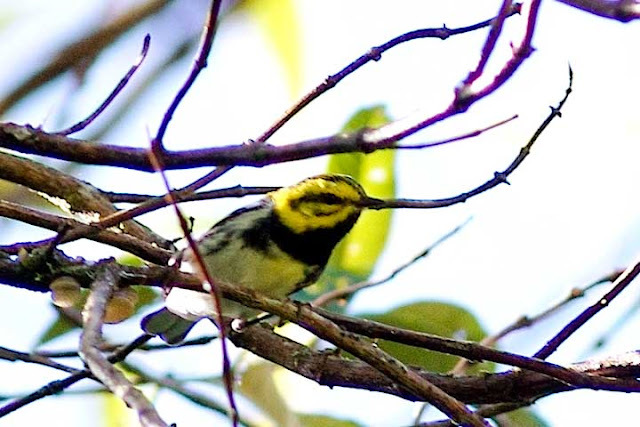 Since I can't determine from this photo whether the yellow wash is on the breast or in front of the breast—that is, whether the yellow wash belongs to the bird or to a leaf blurred in front of i—I would discount that feature and draw attention to the yellow central forecrown-streak. Though illustrations seldom indicate this feature, it is diagnostic of GCWA, and so I would ignore the other shots as distorted and point to this one as clinching the ID. Of course, we cannot know this with certainty. While I was not convinced by the first photo that appeared on the 16th of Feb that the Cerro Punta warbler was indeed a GCWA, I do believe the second photo indicates a present-absent feature that permits the photo to stand as adequate for the species's first documentation for Panama. I think Jan Axel and George were right to begin with. http://www.flickr.com/photos/kksampeck/5642343597/in/photostream/ - what ever it is, it is NOT a GCWA yet it has a yellow central forecrown stripe... I have found pics of a couple of normal-looking TOWAs that have just the tiniest hit of this forecrown mark, so i wonder if it is a suppressed ancestral feature that resurfaces in hybrids - ? 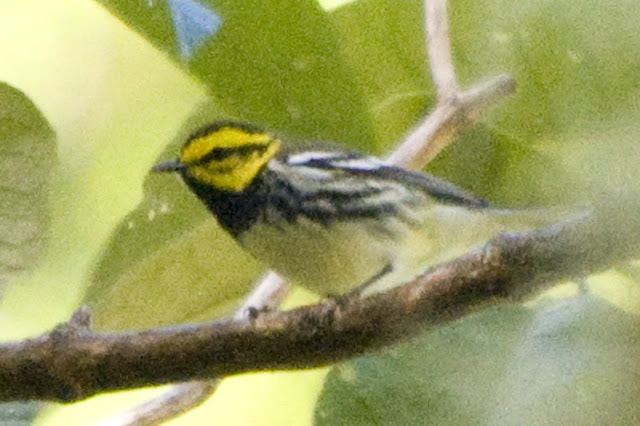 Also I don't think all the images of the Panama bird that show yellow on the underparts can be so easily dismissed. Also I can't find any pic of GCWA with dark on the cheeks similar to the Panama bird - if they do occur, it must be extremely rare. Taking all of this into account, this Panama bird cannot be confirmed as GCWA, I feel.